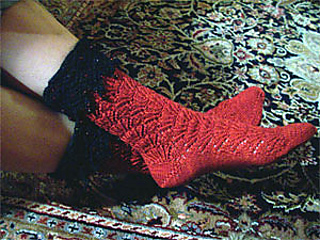 Instep and ankle pattern: Fan lace; a scaled-down modification and inversion of the old Peri’s Parasol pattern. 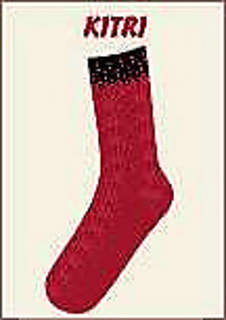 Heel: short-row shaping, with a tiny embossed fan on the back. Toe: The fan pattern extends to the tip and the toe is shaped by the pattern decreases. Cuff: Twisted 1x1 rib, overlaid with beaded lace. The lace is my own design, a shetland-style edging I call Beaded Double Diamond; it’s worked in black Jaggerspun Zephyr, and the beads are a combination of black and silver-lined garnet Czech glass, with a “Tiny Tim” teardrop at the points. Please note that the price listed is for the medium-sized kit. The large kit is priced at $46. If you would like to order this kit, please send me an e-mail indicating whether you are interested in a medium or large.